“And what about constant U.S. propaganda, constant U.S. support of America-oriented non-government organisations by giving them money directly? Isn’t it an impact on our minds? Isn’t it an attempt to influence how we should behave during election campaigns? This continues year after year,” he said. He added that many heads of state around the world had told him of similar U.S. meddling in their internal affairs. But they would not voice their concerns openly, fearing to “spoil relations” with Washington. As for Russia, “we have an opinion of our own, we express it openly. But this is not any sort of underground subversive activity”, Putin said. READ MORE…. VLA Comment: It is about time that someone pointed out that the USA has interfered in many elections of foreign countries, not to mention direct CIA/FBI “regime changes”. This entry was posted in TRUMP NEWS and tagged Putin on June 16, 2017 by Editor. This entry was posted in Liberty & Freedom Room and tagged globalism, Putin on January 25, 2017 by Editor. This entry was posted in Liberty & Freedom Room and tagged Edgar Casey, Putin, Russia on September 29, 2016 by Editor. Russia has adopted a new law that prohibits all GMO crop cultivation and GMO animal breeding in the Russian Federation. Putin and Tkachev believe that the new law will aid Russia in becoming the world’s largest supplier of healthy, environmentally friendly and high-quality clean food – especially since the global demand for organic products is rising quickly. This entry was posted in Genetically Engineered Food, Organic Farming/Organic Food and tagged GMO, Putin on August 18, 2016 by Editor. This entry was posted in Liberty & Freedom Room and tagged Putin on June 21, 2016 by Editor. 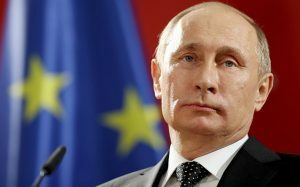 Russian President Vladimir Putin has signed the Russian Federation Code of Administrative Offences into law, including a new article establishing liability for the violation of mandatory requirements for the labeling of food products that contain GMOs. This entry was posted in Death By Medicine, Eugenocide/Population Control, Genetically Engineered Food, Liberty & Freedom Room, Pregnancy and birth, Vaccine Injection Room, You are being poisoned and tagged Putin on March 16, 2016 by Editor. Putin’s speech at the Valdai conference in Sochi, Oct. 24, 2014. This is probably the most important political speech since Churchill’s “Iron Curtain” speech of March 5, 1946. “Let’s ask ourselves, how comfortable are we with this, how safe are we, how happy living in this world, and how fair and rational has it become? Maybe, we have no real reasons to worry, argue and ask awkward questions? Maybe the United States’ exceptional position and the way they are carrying out their leadership really is a blessing for us all, and their meddling in events all around the world is bringing peace, prosperity, progress, growth and democracy, and we should maybe just relax and enjoy it all? Let me say that this is not the case, absolutely not the case”. This entry was posted in Liberty & Freedom Room, Wake up Films & Documentaries and tagged Putin on March 15, 2016 by Editor. The Western government-controlled people are an “intensively vaccinated borderline autistic fat man slumped in front of a screen battling a high-fructose corn syrup comedown”, claims Putin who says that Russians “must be protected … at all costs”. This entry was posted in Articles & Breaking News, Food & Water, Liberty & Freedom Room, Organic Farming/Organic Food and tagged Putin on January 13, 2016 by Editor.